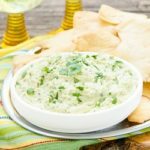 Butter Bean Edamame Hummus is a wonderful dip or spread made with butter beans, shelled edamame, tahini, lemon, white wine, garlic, and spices. Pita chips crackers, or assorted vegetables for serving. Cook butter beans and edamame according to package instructions. Drain and cool to room temperature. Place butter beans, edamame, tahini, lemon zest, lemon juice, wine, garlic, cumin, salt, and pepper in a food processor. Process until smooth. Add cilantro and olive oil. Process until combined. Transfer to serving bowl. Garnish with chopped fresh cilantro if desired. Serve with pita chips, crackers, or assorted vegetables for dipping.